Be the first to share your favorite memory, photo or story of Lodeen. This memorial page is dedicated for family, friends and future generations to celebrate the life of their loved one. 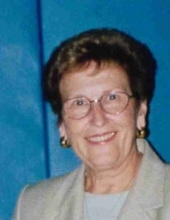 Lodeen D. Clausen, 91, of Louisville, KY formerly of Beatrice died November 8, 2018.
she was appointed by Governor Nelson to the Judicial Nomination Commission for the 5th District of the Nebraska Supreme Court and served two terms. She was a member of St. Paul’s Lutheran Church of Beatrice and enjoyed going to her kids’ and grandkids’ sporting activities. Survivors include three sons, Brian Clausen and wife Patty of Beatrice, Brad Clausen and wife Kim of The Woodlands, Texas, Brett Clausen of Des Moines, Iowa; one daughter, Lisa Wilkins and husband Jeff of Louisville, Kentucky; nine grandchildren; one great-granddaughter; one sister, Twila Hancock; two sisters-in-law, Betty Cecil and husband Mel and Ruth Stroemer and husband Duane of Beatrice. She was preceded in death by her parents, Henry and Clara Yost Diekmann; her husband, Harvey “Pid” who died on October 4, 1999; three sisters, Lorene Boehmer, Delma Zager and Liela Meinke; five brothers, Arlen, Allen, Orville, Merlin and Ralph Diekmann. A memorial graveside service will be at 3:00 P.M. on November 30, 2018 at the Evergreen Home Cemetery with Pastor Greg Stuckwish officiating. A register book will be available for signatures on Friday, November 30, 2018 from 8:00 A.M. until 8:00 P.M. with family available from 6:00 to 7:30 P.M. A memorial has been established to the family’s choice with Fox Funeral Home in charge. www.foxfuneralhome.net Fox Funeral Home of Beatrice in charge of arrangements. To send flowers or a remembrance gift to the family of Lodeen D. Clausen, please visit our Tribute Store. "Email Address" would like to share the life celebration of Lodeen D. Clausen. Click on the "link" to go to share a favorite memory or leave a condolence message for the family.